Shares of A123 Systems, which makes rechargeable lithium ion batteries for electric cars, jumped Wednesday after General Motors said that the company would be supplying the power for the automaker's first all-electric car. General Motors Co. announced Wednesday that the Spark EV will be available in 2013 for certain markets in the U.S. and internationally. The Spark EV will be a limited release but for A123, which had a huge initial public offering two years ago, it's a big deal. Company shares that rose 50 percent and closed at $20.29 on their first day of trading in September 2009, have since tumbled below $5 each. 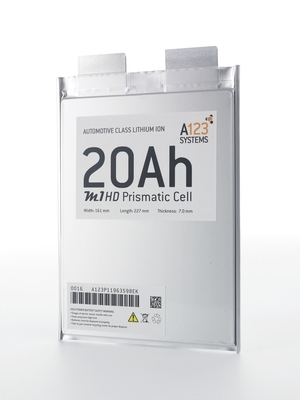 In August, GM announced that it awarded A123 Systems a production contract to produce batteries for future vehicles. A123 Systems spokesman Dan Borgasano points out that the Spark EV will be the first GM car to go to market with the company's battery. Besides General Motors, A123 Systems also has production contracts with German automaker BMW and with Chinese automaker SAIC Motor Corp. The company also provides the battery for the Fisker Karma, a luxury plug-in electric hybrid vehicle, Borgasano said. Shares of A123 Systems Inc. shares jumped 22 percent, or 73 cents, to $4.04 Wednesday afternoon. That's still less than half of what shares cost earlier this year at $10.99. Shares of GM also rose Wednesday. They were up $1.09, or 4.8 percent, to $23.59 in afternoon trading.